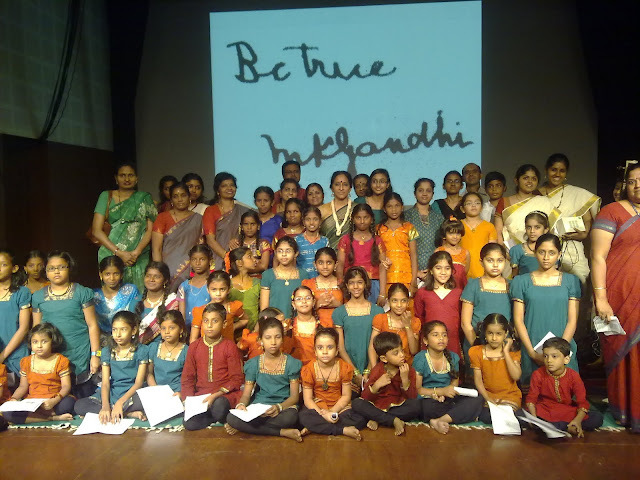 The Aseema Trust was founded to build bridges between traditional performing arts and education and Mahatma Gandhi and his ideas of truth and non violence inside and outside schools for young and old. Founded by V.R.Devika in 1998, it is managed by Coordinator and finance manager Vasantha Parthasharathy and a large team of resource persons. The Aseema Trust is nurtured by the partnerships it has built with NGOs and other organizations over the years nationally and internationally. Dr.V.R.Devika gave a presentation on "Nataraja and the cosmos" on 1st April 2019, gave the keynote address on a national seminar on N.Muthuswamy organised by Talaikkol Pondicherry on 29th March 2019, gave an illustrated talk on "Collective consciousness celebrated in Therukoothu and Devarattam" at the Natyamritha Manthanam seminar on 23rd March 2019, guided visitors at Kalakshetra on 18th March 2019, was chief guest at the inauguration of community centre at Kalavai Kootroad on 16th March 2019, guided visitors at Kalakshetra on 11th March 2019, took part at Utsavam seminar at Dakshinachitra on 5th March 2019, compered a show for ICCR on 4th March 2019, was on the interview panel at Vedanta academy on 3rd Marc 2019, was a panelist at Vendum on 3rd March 2019, guided visitors at Kalakshetra on 1st March 2019, gave a talk on Dr.Muthulakshmi Reddy at the seminar at the Govt. Museum, Chennai on 26th February 2019. The Aseema Trust conducted a Gandhi session and spinning demonstration with Dr.V.R.Devika, Vasantha Parthasharathy and Karunakaran at Olcott School on 23rd February 2019. Organised by Bhumi Nakshatra. Dr.V.R.Devika gave a presentation on Gandhi for SPICMACAY at NIT Trichy on 17th February 2019. Dr.V.R.Devika was a chief guest at the annual convocation at Rukminidevi Natyakshetra on 3rd February 2019, gave a presentation on Gandhi at Patashaala on 30th January 2019, a presentation on "When the Sartorial became poitical" in Coimbatore on 21st January 2019, a presentation on "Nataraja and the Cosmos" on 20th January 2019, on Rukminidevi at RNF on 5th January 2019.